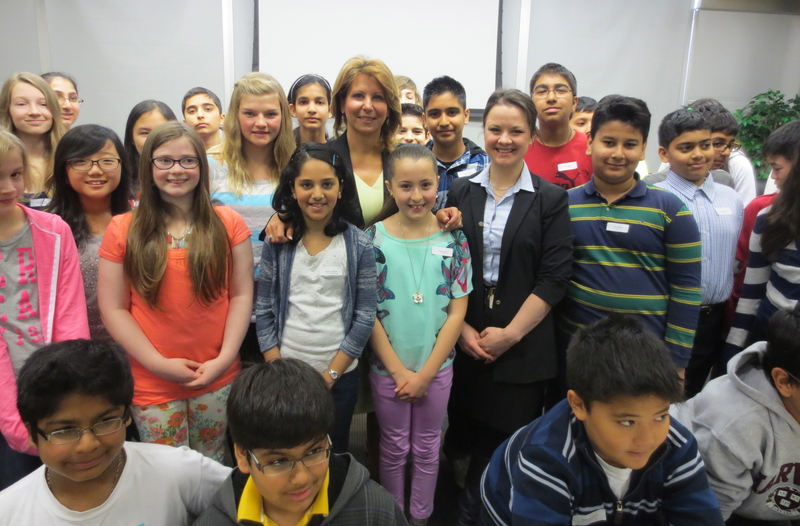 On Friday, April 5th, 2013, seventy of the Surrey School District’s brightest young leaders gathered at the District Education Centre. The event was the 15th annual Leadership Symposium for students in grades 6 and 7. The day was introduced by Gifted Helping Teacher, Tybie Elenko, followed by an inspiring keynote address and question period with Mayor Dianne Watts. Next, Tiffany Poirier, District Gifted Challenge Teacher and founder of The Learning Coats Project, presented a workshop inspiring students to explore metaphors for who they are as leaders in the process of creating their own symbolic “Learning Coats”. Throughout the day, students engaged in arts-based research into leadership and identity as they made and reflected on the colourful, collaged Learning Coats. Each Learning Coat contained a student’s written reflections and miscellaneous objects he/she chose as symbols and reminders of leadership. Students wore and shared their Learning Coats and dialogued about what it means to lead and how they might better the world. During the day, students also enjoyed a workshop with Dr. Catherine Etmanski that linked environmental issues with leadership. The event was assisted by Gifted Challenge Teachers Helen Kelsey-Etmanski and Sharon Nijjar. Previous post ← Mini Learning Coat!